This second part of the exploration into short rows and their usefulness in socks concentrates on the how part of the short row mystery. Specifically, though, it is a look at how I make my short row heels and toes. My method is not in any way the definitive method – there are many ways of knitting short rows, and this just happens to be my personal favourite for both looks and ease of knitting. Wherever you are starting your heel or toe, whether beginning toe-up with a provisional cast on, knitting the toe last, knitting the heel in-line or as an afterthought, you will be knitting over exactly half of your total leg circumference stitches. Instances of how to set up placement of your heel or toe are given in part one of this look at short rows for socks. So, for a 48 (52, 56, 60, 64, 68, 72) stitch sock, start with 24 (26, 28, 30, 32, 34, 36) stitches on a single DPN/circular and knit back and forth. 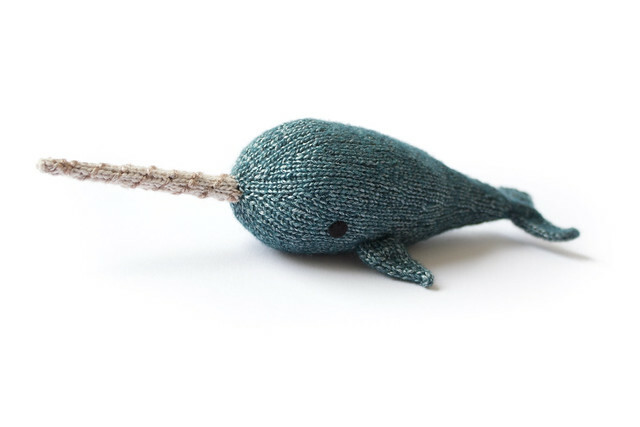 All stitches should be slipped purl-wise. Row 1 (RS): Knit until last stitch, bring yarn forward between needles, slip last stitch to right needle, bring yarn back to rear of work, slip stitch back to left needle. There is now a ‘wrap’ around the base of the last stitch. Turn work. Row 2 (WS): Purl until last stitch, take yarn backwards between needles, slip last stitch to right needle, bring yarn to front of work, slip stitch back to left needle. Turn work. Row 3: Knit until one stitch before nearest ‘wrapped’ stitch. Bring yarn forward between needles, slip last stitch to right needle, bring yarn back to rear of work, slip stitch back to left needle. Turn work. Row 4: Purl until one stitch before nearest ‘wrapped’ stitch, take yarn backwards between needles, slip last stitch to right needle, bring yarn to front of work, slip stitch back to left needle. Turn work. Repeat these last two rows until you have 10 (10, 12, 12, 12, 14, 14) unwrapped stitches in the centre of your short row sections. You’re not finished yet, but at this half way point, take a little while to get to know your wraps. Knitting short rows is made much easier if you can recognise your wraps. Here, changing yarn colour has helped highlight the ‘collar’ of yarn sitting around the base of the stitch it is wrapping. The stitches to the left of this newly wrapped stitch are also wrapped, but in the red yarn and so are less obvious at first glance. The next part of knitting your short row heel/toe involves re-knitting over your wrapped stitches, picking up the wraps as you go, and working one further row each time. Row 1: Knit to the first wrapped stitch (1). Slip that stitch to the right needle (2). Using the tip of the left needle, pick up the wrap (3). Place the slipped stitch back onto the left needle, alongside the wrap. Knit the stitch and its wrap together, through the back loop (4). Bring yarn forward between needles, slip last stitch to right needle, bring yarn back to rear of work, slip stitch back to left needle. Turn work. Row 2: Purl to the first wrapped stitch, slip that stitch to the right needle, using the tip of the left needle, pick up the wrap. 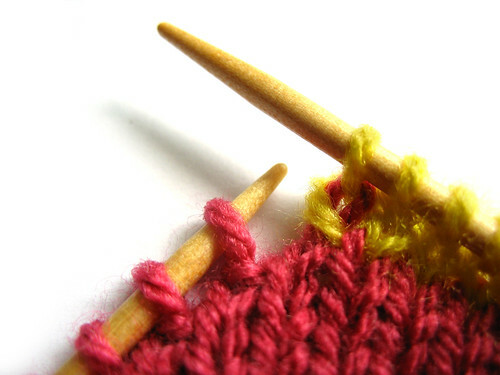 Place the slipped stitch back onto the left needle, alongside the wrap. Purl the stitch and its wrap together. Take yarn backwards between needles, slip last stitch to right needle, bring yarn to front of work, slip stitch back to left needle. Turn work. Row 3: Knit to the first wrapped stitch, which now has two wraps. 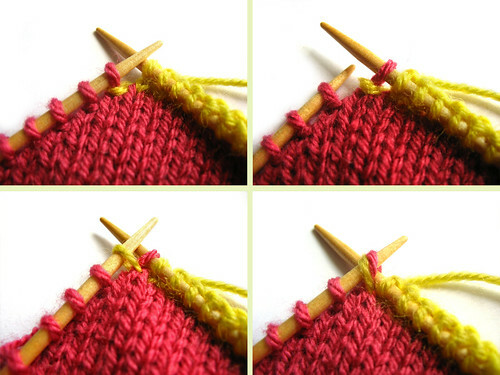 Slip that stitch to the right needle, using the tip of the left needle, pick up both wraps . Place the slipped stitch back onto the left needle, alongside the wraps. Knit the stitch and its wraps together, through the back loop. Bring yarn forward between needles, slip last stitch to right needle, bring yarn back to rear of work, slip stitch back to left needle. Turn work. Row 4: Purl to the first wrapped stitch, which now has two wraps. 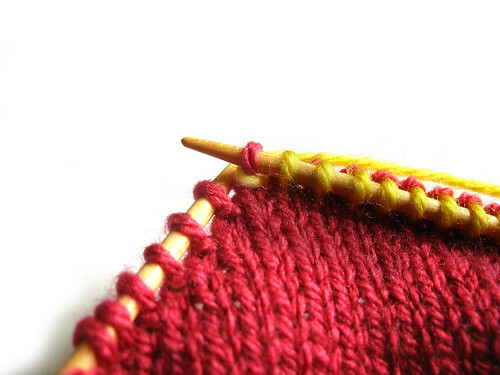 Slip that stitch to the right needle, using the tip of the left needle, pick up both wraps . Place the slipped stitch back onto the left needle, alongside the wraps. Purl the stitch and its wraps together. Bring yarn backwards between needles to rear of work, slip last stitch to right needle, bring yarn forward between needles, slip stitch back to left needle. Turn work. Repeat rows 3 and 4 until all wraps have been knitted together with their stitches. You are now ready to either undo your provisional cast on for your toe-up sock and surge ahead with your knitting, carry on with your sock if you are making an in-line heel or kitchener your stitches with their waiting partners to complete your sock for an afterthought heel or top-down sock. Short rows are simple, really. Thank you for your excellent tutorial. Your socks look so perfect! I have tried out the tutorial and yes, once you know how it is all reasonably simple. It’s just hard to find ALL the information you need. I wasn’t sure when the rows were completed until I found this, so thank you. One thing I would say: I did this several times before I was happy. The purl side looked lovely but the knit sides stitches looked bigger and just not so nice. It took me a while to recognize why. It was because the stitches while being wrapped are also slipped so are bigger than usual. On the purl side after picking up the wraps and purling and then turning I was securing the wrap with a knit stitch and the ones next to it were also knit stitches. On the knit side, the reverse was true. As my purl is a bit looser than my knit the wrapped stitches were bigger than the stitches on the other side. When I realised it wasn’t anything to do with the wraps I made sure I tightened up the stitches that were going to be wrapped next time around on the row before and also as the first stitch securing the wrap I had just done. This worked nicely and now both sides look really nice. The point I am learning about short rows (the same went for German double stitches) is to keep everything nice and tight around the wrapped stitches. Great tutorial, I appreciate it. Thank you so much! I tried other short row heel tutorials but I kept frogging them because I either didn’t like how the join looked in the end or I lost my place along the way. This one is definitely the keeper! This is the post I come to EVERY time I finish up a pair of socks. Thank you! is this tortorial for sock yarn or any kind of yarn?? You can use this to knit the heels/toes of socks that you knit in any weight yarn. 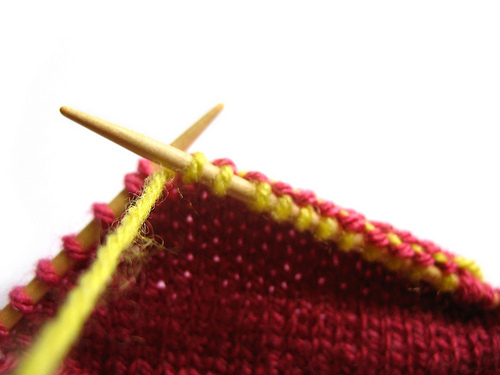 The number of stitches that you knit your sock with will determine the number of short wrap rows that you knit. I won’t be using this to knit socks, but it looks like an excellent way to work mittens from the fingers to the wrist. Thank you very much! my question is, once you get to the last double-wrapped stitch on the first needle, and knit it with the wraps, how do you turn it again to purl to the last double-wrapped stitch on the other needle? if you wrap the next stitch and turn, you just have another wrap to get rid of, right? I usually carry the round on (not turning, but knitting across the instep stitches) and then knit the wraps with the stitches at the other side when I reach them. This makes no sense. What do I do with the top of the sock? The only you tubes I can find are for toe-up, but this is a top down sock (your pattern Gentle Waves). I am extremely frustrated and simply don’t understand what you are talking about. Can you please help? Quickly, as I need to finish this pair of socks. I’m sorry that you do not seem to understand the process of short row heels, but your rather terse message does not give any indication of what issue you seem to be having. I am sorry to hear you are frustrated, but you would need to explain with a little more indication of what your issues are for anyone to be able to help. For further information, please note that a short row heel is worked the same whether toe-up or cuff down. As you will be able to see, many other people have benefitted and been helped by this tutorial, so if you can explain your problems a little better I will endeavour to help any knitter I can, as long as they are courteous. If I am doing top down socks and want to use a short row toe like this, where should I end the foot part and begin the toe? Would it be right at the toe line where I would start a normal decrease toe? Does that make sense…I dont want to crowd the toes but I dont want it too long either so do I begin when I have about 2 inches to the top of the toe like normal? Thanks so much I cant wait to try this as I HATE the seam across my toes and this will work much better if the seam is across the top of the foot instead! I have a question about the second half of the toe. Row 1 Part 3 says to knit the stitch and its wrap together, through the back loop. This automatically puts the stitch on the right needle. However part 4 says to bring the yarn forward and slip the last stitch to the right needle, bring the yarn to the rear and slip the stitch back to the left needle. How can I do this if it is already on the right needle?